Have you ever thought about the difference between customer acquisition and customer satisfaction? Acquisition means I’m going to get a customer while customer satisfaction means I’m going to satisfy a customer—to me they are no different because I want to satisfy the customer but I also want to acquire the customer. The reason you want to satisfy a customer is that because if you don’t satisfy them you’re not going to stay in business. Someone is going to come and make your deal better. Look at Uber, they basically took an industry that was antiquated, that people complained about around the world, and an industry was changed overnight. Without a customer there is nobody to service, that’s why at my companies I’m always talking about acquisition. In truth, acquisition is actually the satisfaction of a customer because for me to get a customer I had to make them happy in the product, the offer, and in the solving of a problem. Acquisition should be your primary concern. Even if you’re the receptionist or you’re in shipping, technology, or even the accounting office, you should be thinking about as an employee customer acquisition and customer satisfaction, not just your job. You don’t have a job without people being happy. Politicians get fired because people are done paying them 175K to promise one thing and deliver something else. This is the same reason why jobs get shipped overseas and why bank tellers don’t exist anymore. Bank tellers don’t exist because of technology or that banks wanted to reduce their costs, the bank teller doesn’t exist because I didn’t want to wait in line for someone who didn’t know my name, couldn’t smile, and couldn’t make me feel special. The bank teller should have done such a good job that I literally didn’t want to bank online. 20% of satisfied customers intend to leave your company for a competitor no matter what you do. Loyalty today to a company is not what it used to be. People flip and switch products. 20% of your customers will switch no matter how good you treat them. That doesn’t mean you throw the towel in and quit. You can’t be everything to all people, and you can’t be everything to all people all the time. Stay focused on acquiring customers and volumes. The ultimate play on customer satisfaction is to go wide. Acquisition of customers is the ultimate solution to customer satisfaction. There is an upside and a downside to this. The upside is you have to get big if you want to satisfy more customers. You have to get giant. Great companies must get big. While you might think of Apple and Microsoft as starting in a garage, we do not know them because they stayed in a garage. They got big and went real wide. Coca-Cola had to go wide for us to know their name. The Acquisition of customers is the gateway to customer satisfaction. I used to think if I stayed small I could satisfy my customer better. It was a lie. Someone might say, “I’m going to be a boutique watch stop and we’re going to give such unbelievable service because we only have a few customers”. They’ll cease to exist. You need more customers and go wide to get better quality customers. This is vital. It’s through the acquisition of customers that you’ll find quality customers that want to be happy, people that want to be satisfied. Stay focused on the acquisition of customers in volumes large enough so that you can discover people that can actually be satisfied. Remember 20% of your customer base will flip to another product no matter what you do to them or for them. If you’re not interested in bringing customers in, it’s an indication of how engaged you are and how you feel about what you’re selling. So start acquiring more customers and you will start to satisfy more customers. 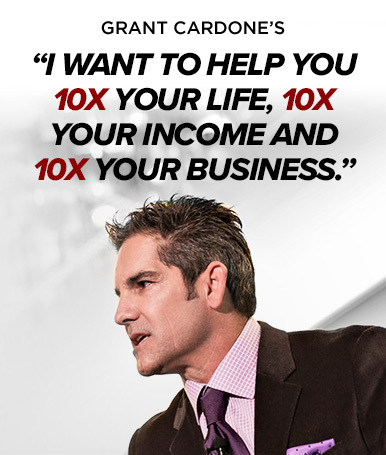 For more, get on Cardone University where I recently added a brand new customer service module. I’ll not only give you more tips on how to acquire and satisfy more customers, I’ll give you the top customer complaints and the precise word tracks to acknowledge the customer’s issue, diffuse the situation, and handle a customer’s concern appropriately. The more customers you acquire, satisfy, and take care of any issues, the richer you’ll become. Also be sure to check out the Memorial Day sale at my store where I have all kinds of products at killer deals for this weekend only. Very useful article. Thanks you for sharing! Grant, as usual you provide massive insight. Thank you for the free tip. I’m looking into Cardone U now. Thank you for all you do! !